EN 61181 ed. 2 Mineral oil-filled electrical equipment - Application of dissolved gas analysis (DGA) to factory tests on electrical equipment - Specifies oil-sampling procedures, analysis requirements and procedures, and recommends sensitivity, repeatability and accuracy criteria for the application of dissolved gas analysis (DGA) to factory testing of new power transformers, reactors and instrument transformers filled with mineral insulating oil when DGA testing has been specified. The most effective and useful application of DGA techniques to factory testing is during the performance of long-term tests, typically temperature-rise (heat run) and overloading tests on power transformers and reactors, also impulse tests on instrument transformers. DGA may also be valuable for over-excitation tests run over an extended period of time. Experience with DGA results, before and after short-time dielectric tests, indicates that DGA is normally less sensitive than electrical and acoustic methods for detecting partial discharges. However, DGA will indicate when these partial discharges become harmful to the insulation and may be detected by inspection . 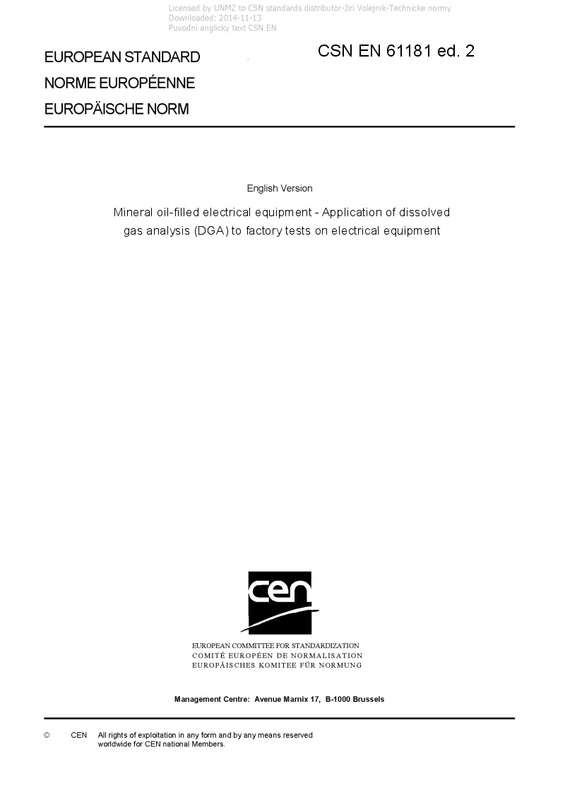 This edition includes the following significant technical changes with respect to the previous edition: a) the specific procedures used during factory tests (sampling location, sampling frequency, gas extraction and chromatographic analysis in the laboratory) are described in more detail; b) information is provided in Annex A concerning the residual gas contents recommended before thermal tests on power transformers, typical gas values observed during the tests and cases where gas formation during the tests was followed by problems in the transformers; c) typical values observed during chopped lightning-impulse tests on instrument transformers are indicated in Annex B.